Some people say that having the government subsidize mortgage payments for financially troubled homeowners puts the government in the position of rewarding bad behavior. Is the government rewarding bad behavior when it provides subsidies to those who are most at risk of losing their homes? 55% said yes and only 32% said no. But it’s a leading question! When the Washington Post and New York Times asked a more straightforward version of the question (Post: “Would you support or oppose the federal government using 75 billion dollars to provide refinancing assistance to homeowners to help them avoid foreclosure on their mortgages?”) the results were reversed. Over 60% supported the plan. 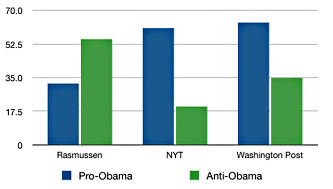 Matt Yglesias converted these results into handy chart form, which I’ve stolen and displayed over on the right. The basic meme in the leftosphere is that Rasmussen deliberately chose conservative wording here and the results aren’t to be trusted. But I want to push back on that a bit. There are two points to make here. First, these poll results aren’t necessarily contradictory. It could well be that some people think Obama’s plan is likely to reward bad behavior in some cases but they support the plan anyway. Second, there’s something to be learned here if we don’t dismiss Rasmussen’s results out of hand. Here’s the problem: liberals often suffer from poll literalism, a disease in which we look at simple poll questions and think they show that everyone supports us. 60% support national healthcare! 70% support more spending on education! Hooray! But those numbers are largely meaningless. The real question is, How many people still support national healthcare after conservatives have spent months scaring everyone into thinking it means they’ll never be allowed to see their old family doctor again? Probably not as many. Likewise, how many people will support Obama’s mortgage plan after they’ve heard all the conservative talking points against it? Probably less than the Post and the Times say. Now, my guess is that once everyone’s had their say, Obama’s plan will still garner considerable support. But it might not, and understanding how Republican talking points affect public opinion is valuable. That’s what Rasmussen has told us here, and it’s worth paying attention to.